Hello! Since our last blog back in February we’ve had a few exciting and intense months setting up our new roastery space on the farm where we live. 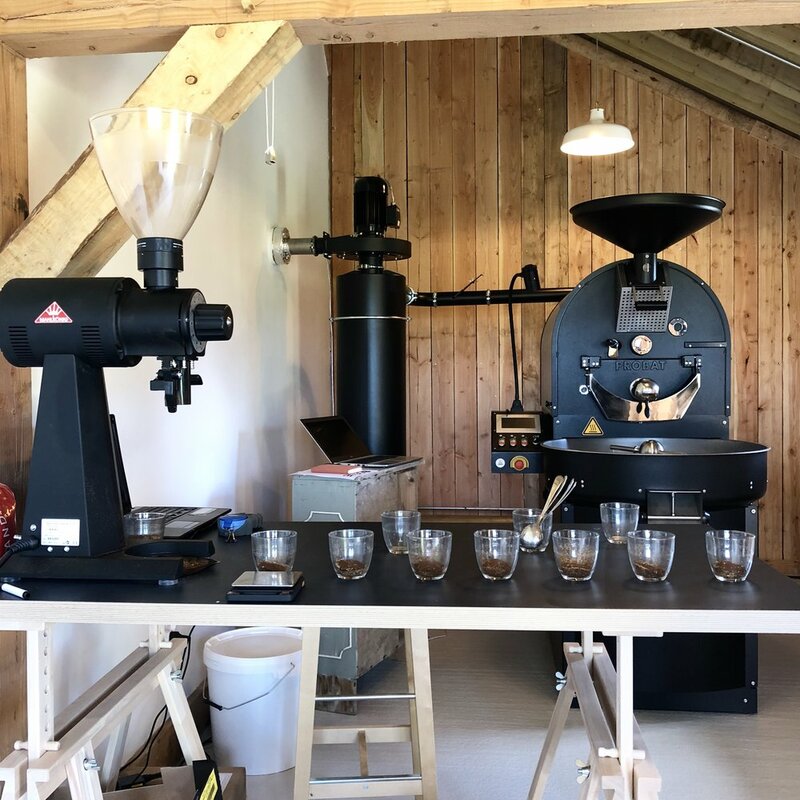 It’s included the refurbishment of a wooden shed and the installation of a new Probatone 12-kg roaster that miraculously made it over from Germany undamaged, despite various adventures along the way. The machine is a beauty and we love it! It’s taken us quite a bit of time to get all the right equipment necessary to make the roastery a functional place and now that we’re up and running we are excited to introduce you to some tasty new coffees. We first met Astrid Medina on her remote farm high in the Andes mountain range in southern Tolima. It was 2015 when she won Colombia’s Cup of Excellence competition. She immediately came across as a very genuine person, passionate about her business and caring for her community. Both Astrid and her husband Raul were the most generous guests and showed us around their amazing farm with coffee trees growing on vertiginous slopes. At that time we were living in Colombia’s capital city, Bogota, and it took us about 10 hours on a small and crowded bus, plus another hour by jeep to reach the village of Gaitania, near which Finca Buenavista is located. It was definitely worth it! The rich soil, abundance of fresh water and the farm’s high altitude (1800m – 2000m above sea level) all helped to grow the prize-winning coffee, plus “the love we put in”, Astrid told us. We met Astrid & family (they always travel together) several times after that initial visit and were able to appreciate their great efforts to continue producing beans of the highest quality. So several years later we are absolutely thrilled to be roasting their coffee! This lot of Caturra variety beans is clean in the cup and displays bright notes of lemon and lime, followed by an all-round floral sweetness and hints of chamomile. We’ve roasted it for filter preparations but it’s also great as an americano. As we love African coffees we decided to try this exquisite Rwandan peaberry from the Kageyo washing station in the Western Province. Coffees trees typically produce two beans (seeds) inside each cherry (fruit), but occasionally only one seed develops that is more spherical in shape than normal coffee beans. This enables better heat transfer during roasting and some experts say peaberry coffees typically taste better than their flat-sided brothers. The beans in this lot are of the Red Bourbon variety and are grown at an altitude of approximately 1700 meters above sea level by several smallholder farmers near the washing station. The farmers came second in Rwanda’s 2010 Cup of Excellence and they’re still producing great coffees. We taste notes of apricot and peach, with an apple acidity that gives way to a full-bodied, creamy mouthfeel and a sweet, jammy finish. Roasted to be drunk as a black coffee – either filter, espresso or americano. Our Brazilian espresso roast remains unchanged! It’s still the deliciously nutty single origin coffee from the Serra do Cigano farm in Sao Paulo state. While our Colombian and Rwandan coffees are washed in vats of water during the processing stage, these Brazilian beans are dried with their skin still on, a method known as the ‘natural’ process. This enables a transmission of sugars and flavours from the skin into the bean, and gives this particular lot some distinctive notes of tropical fruit. The beans were grown by Joao Hamilton and his partners on their 10-hectare Serra do Cigano farm. Since joining the FAF network in 2006 the team have sought to grow top-quality coffees without using toxic fertilizers and herbicides. We think the results are evident in this full-bodied, nutty and fruity coffee that’s perfect for espresso and milk-based drinks. Enjoy! And please get in touch with us if you like to order some (info@carrow.ie). This is our first blog since we’ve been back in Ireland and lots of exciting things have happened since then. We started exploring the possibility of setting up a coffee roasting business during our time in Colombia and were thrilled to finally launch Carrow Coffee Roasters and start selling our coffee bags at local markets and shops throughout Sligo last November. And the response has been very positive! We plan to bring you regular insights and stories about the coffees we’re roasting on this page, so stay tuned! This month we have two new coffees, a bright Colombian and a fruity Rwandan, both light roasted and recommended for filter. We are delighted to have our first Colombian coffee for sale, a country where we lived for four years and travelled extensively. This coffee is a blend of micro-lots from several small farms located in the area of Bruselas and Pitalito in the Huila region, Southern Colombia. It displays wonderful grape-like acidity and juicy notes that remind us of greengages, with a sweet finish of ‘panela’ – the unrefined cane sugar produced throughout Colombia. The bean varieties are called castillo and caturra, both typical of Colombia. The former was developed by the Colombian Coffee Federation’s scientific unit to resist coffee leaf rust (roya), a fungus that has decimated many plantations throughout Latin America by eating coffee leaves. Huila isn’t one of Colombia’s traditional coffee-producing regions, but thanks to increased planting and improved farming techniques it is now Colombia’a largest beans producer. And it’s not all about volume, as several winners in the Colombia Cup of Excellence in recent years come from Huila. The Rwandan is bursting with mandarin juiciness and more subtle floral notes with a distinctive taste of sweet tobacco on the finish. The mouthful is creamy and smooth. The beans come from several small farmers in the Nyamasheke District in Western Province that borders Lake Kivu, an area we visited some years ago on the Congolese side of the lake. The coffee variety is bourbon, originally from the island of Réunion and today prevalent in Rwanda. The country’s coffee industry was decimated during the 1994 genocide but since then the country has made a concerted effort to focus on higher-grade specialty coffee with considerable success, inspiring Burundi to replicate the model. If you would like to read more on this we can recommend the following books: ‘God in a Cup’ by journalist M. Weissman and ‘The World Altas of Coffee’ by coffee expert J. Hoffmann. As we are still building our online shop, please drop us an email if you would like to order some coffee (info@carrow.ie).